Wellington is still blessed with some very good secondhand bookstores and I’ve never read any Henry James. I’ve got to the bottom of the first page. So far it’s very Jane Austen-ish. “The Left are natural dreamers, and so they have a ready supply of heroes,” write Douglas Hurd and Edward Young in their biography of Benjamin Disraeli. I don’t have political heroes: the whole concept seems a bit naff to me. But of the political heroes I don’t have, these two come top of the list. In my early 20s, in a dusty second-hand book store upstairs in Auckland’s Elliott Street, I found an old 19th Century poster etching of Disraeli. Had it on my bedroom wall for years, when flatmates had Whitney Houston, Morrissey, or Michael Jackson posters. I’d read essays on the guy, he sounded interesting. And witty. Burke, I discovered in a first year politics paper – Auckland University’s great ‘Law, Property and Individualism’ course on political philosophy from Plato through to Mill. Andrew Sharp is still the best university lecturer I ever had, on any subject, I think. Lucid and clear, with an engaging informal approach – he never wasted a word in his lectures, yet he still usually explained things three times, at least for his stage one class. I’d heard of Burke, but knew nothing about him apart from a few quotes (the one about society being a contract a contract by the living with both the dead and those yet to be born, and the one about a member of Parliament owing electors his judgement not his obedience). This was the mid-1980s and politics in New Zealand was awash with ideological debate…actually, that’s not quite correct. The Labour Party, in government, was awash with ideological debate. ideological and factional debate (the two are often hard to distinguish from each other), that is. By the end of the decade the Labour Party was the only party with clubs on campus – but there were three of them*. The conservative side of politics was somewhat confused. National had gone down this weird route under Sir Robert Muldoon and was still trying to recover. Roger Douglas had implemented many of the policies National’s more ideologically inclined – never a very large group – had long wanted to carry out. The rest of National, meanwhile, was spitting with rage and pain, as Rogernomics went through the farming sector and the country’s protected industries like a runaway bulldozer through a Crown Lynn surplus china goods shop. It was a difficult time. And if you were trying to get a ‘fix’ on your own political outlook, as I was, it was tricky. I clearly wasn’t a socialist of any kind. There was the emotionally attractive but intellectual double-blind alley of simplistic and unrealistic nostalgia offered by Sir Robert Muldoon’s dwindling followers and the larger and louder New Labour backers of Jim Anderton. The need for many of the Rogernomic reforms was clear. What was also clear was the collateral damage they were causing. Burke’s wariness about simplistic, theoretically driven reforms imposed on a society without due respect and attention to that society’s traditions and values made a lot of sense – intellectually and emotionally. Together with Disraeli’s wit and often wispy rhetoric, they make an appealing package for conservatives, even today. Disraeli and Burke are conservatives – subtle and profound ones. 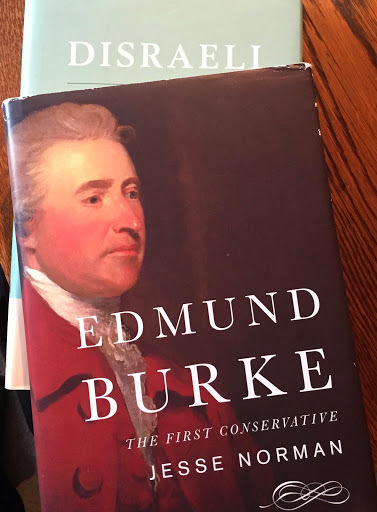 Both were in fact outsiders of the society in which they found themselves: Burke was Irish, and even though he was Protestant Irish it lent him a certain distance (his mother was catholic). Disraeli was a novelist, a dandy, with a suspiciously raffish background and a Jewish heritage, who somehow got the Conservative Party of the 19th Century, populated with lords and landowners, squires and soldiers, clergymen and churchgoers, to accept him as leader. It is the sheer, preposterous unlikeliness of Disraeli which makes up a big part of his appeal. He defies almost every stereotype with which we associate the words ‘conservative’ and ‘Victorian’. And they were both, of course, writers. Burke was not a particularly successful politician, although he did attain moderate ministerial rank: Disraeli was a spectacularly successful politician – in the end. He suffered decades of failure, and he was to muse, when he finally got the prime ministership, that he had got it too late. But he was also, as Hurd and Young show in their biography, ‘always a novelist even when writing no novels at all’. That, rather than winning elections or running governments, is his real legacy and achievement, although he was pretty good at those more prosaic things too. Someone called it ‘the politics of drains’ – Disraeli’s governments, particularly his 1874-80 one, did quite a lot of this. (The other two were short-lived affairs). Most of all, he was able to make an imaginative, empathetic leap and realise the rising middle classes, and in particularly a sizable chunk of the increasingly unrestful working classes, would happily vote conservative. No one else seems to have thought so at the time. There was a fear of what ‘the mob’ would do if they were given any sort of power. But he taught his party, and his lesson for conservatives remains. There was, for example, a public argument between with Lord Cranborne, then a newspaper editor but later, when he inherited his family title of Lord Salisbury, to himself lead the Conservatives – about extending the right to vote beyond the aristocracy and landowners to other people. Disraeli was prepared to extend the right to vote to more working class men (votes for women was, at the time, only advocated by the real radicals) than was the Liberal Party of the time. Although supposedly the more ‘progressive’ the Liberals were worried about whether those voters were quite up to it. Shouldn’t they just be content to be guided by the wiser and better beings, (of whom the Liberal Party of the day, naturally, considered themselves the prime examples)? Disraeli cut through all that cant and hypocrisy, all that snobbery masquerading as concern. As I’ve written in the National Business Review recently , (paywalled) it was something emulated by successful conservative leaders around the world – including in New Zealand. That returns us to the comment about the Left being ‘natural dreamers’. This takes many forms, and it is particularly pertinent in New Zealand at the moment, with our Labour Party talking about ‘dreams’ in almost every pronouncement. One of my own, personal, rules of politics is whenever any politician, of any stripe, starts talking about “dreams” what you are about to hear is usually undiluted bilgewater. George Orwell put it differently – in a prosperous country, he once said, radical politics is usually a form of make-believe. I’ll return to this one another day – it opens up a whole area to explore about the nature of ideology and left-wing politics and the type of mindset which is attracted to both. Disraeli, the authors of this latest biography conclude, ‘did not simply outwit his opponents. He also persuaded the vast majority of his supporters that this was actually a direction in which they wanted to go’. They quote Walter Bagehot’s deliciously apt metaphor that Disraeli guided the Conservative Party as the mahout guides the elephant, light in strength but knowing all the party’s habits and ways. In New Zealand? The lessons are there for conservatives here, but they are not about copying or aping what British counterparts have done. The key part of Disraeli’s approach (and, even more so, Burke’s, and I will come to this below) is about ‘the manners, the customs the laws and traditions of a people’. New Zealanders are not Brits. We have our own manners, customs, laws and traditions. Along with an emerging sense of our own history as something distinct and something our own, and these are becoming stronger and more confident by the year. I plan…and here I use the word ‘plan’ somewhat loosely.. to write more on this. There have been several books on Disraeli – the ‘authoritative’ one is by Robert Blake. It is thorough, reasonably but not excessively adulatory, and just a little bit dull. Hurd and Young capture Disraeli’s essence – or his importance, anyway – in a much shorter and more readable book. They are sceptical, occasionally with some astringency, about Disraeli’s more shameless exploits (and there were more than a few of those, one of which – the elevating of imperialism to an explicit, crowd-pleasing political policy, produced a lot of long-term harm). So I’m not starry-eyed about him. Admirable and fascinating in many ways, there was a streak of frivolity which occasionally tipped into something darker. Burke does not, in fact, dismiss philosophy or metaphysics quite as comprehensively and certainly not as unthinkingly as that quote suggests: instead one of his great themes is that ‘universal principles themselves are never sufficient in themselves to guide practical deliberation’. ‘a rich and distinctive world view of his own….Each[social order] is sui generis, a largely incremental and historically continuing human achievement…Any practical or theoretical reflection on such a human artifact – and this applies to any institution, large or small, peoples and nations as much as words or ideas – must therefore begin with history and experience. Markets need to be respected because they reflect people’s myriad individual choices. They are not the product of some idealogue scribbling out a theoretical construct of society – their strength is they evolved out of humans doing what comes naturally. They work best when the signals they send about people’s preferences is subject to as little interference as possible. But they also are just one custom and tradition. They need to work within the customs and mores of that broader community – – in New Zealand’s case, within our ideas and assumptions about ourselves, about what makes us distinctive as a people. This is, I think, – becoming more important in how our own politics is framed. That, though, touches on my paid work, and for now it is the weekend. More on that, in another forum. For now, I’d recommend both these books for anyone of a conservative frame of mind – and anyone who wants to understand some of the more important and subtle, but less understood, currents of the conservative tradition. * I am going by memory here. No doubt someone will be able to dig out the records or minutes from some tedious and lengthy meetings of trainee 20 year old polticians which show there were only two. Or five. Good luck to you, whoever you are. August 9 is Book Day in the United States. Scanning the news bulletins beaming out of that strange and excitable outlier* from the rest of the English-speaking world, it’s difficult not to conclude that a quiet sit down with a long book for a week or two would do American citizenry a power of good. New Zealand doesn’t have a Book Day. We probably should. We have days for lots of things, including public holidays for provinces which haven’t existed since 1876, and for the birthday of a monarch on a day which isn’t actually her birthday. We should be able to manage a Stay In Bed & Read Day – sometime around mid-winter, say. Or – for Wellingtonians, anyway – whatever day the Downtown Community Ministry Bookfair is held. This is like a festival of second-hand books, and people queue in the rain for it (yes, seriously. In how many other cities in New Zealand do people queue in the rain for second-hand books?? ). A few months back I stumbled across a bunch of Companion Library books at a second-hand bookstore in Petone. I don’t know the history to the Companion Library series, but I know it was a cheap way to get ahold of some of the great classics. They were available on some sort of hire purchase plan, I think. They were via mail order, and you got one every couple of months or something similar. There was no actual ‘front’ and ‘back’ to each volume – each volume had two books, and you flipped them over and read in from each end. They were cheap – all the books were well out of copyright, and I bet even for their cheapness someone was making a packet out of them. The first one my folks got for us was Alice in Wonderland, and I can’t for the life of me remember what was on the other side of that volume. Had a huge effect – I had vivid dreams anyway, and here was a tale about a very vivid dream. The volumes I read most often was the one which had Grimms Fairy Tales on one side and Hans Christian Anderson’s Tales on the other. Wore that one out. More vivid dream fodder, of course, with more than a touch of menace. And in the case of the Hans Christian Anderson stories, menace with moralism. Aesop’s Fables was also a fave – and I notice now, looking back, that like the Grimms/Andersons volume, it was short stories. The thing I remember most about the Aesop’s Fables was discovering the origin of a few phrases (‘Oh, so *that’s* where “sour grapes” and “dog in a manger” comes from!’). I presume the Companion Library has long since been discontinued. You can get all these on Kindles now. Probably for free or as close as makes no difference. Anyway, Happy Book Day, wherever you are, and Happy Reading, on any day and any device. Posted on August 9, 2016 August 9, 2016 by Rob HoskingPosted in books, Litrachure, reading, WellingtonTagged Aesop's Fables, Alice In Wonderland, August 9, Book Day, books, Companion Library, Downtown Community Ministry Book Fair, Grimms Fairy Tales, Hans Christian Andersen, Outliers, Second Hand Books, Steve Braunias.